Nigerian Agidi Jollof is mostly eaten as a snack but you can also serve it as a light lunch or dinner. Agidi Jollof is derived from its white counterpart Agidi/Eko but with some added ingredients. It is just like when we compare White rice and stew to Jollof Rice. 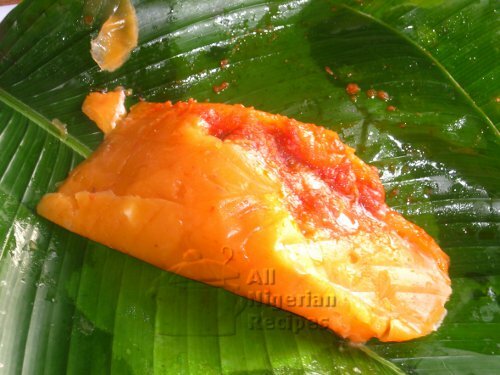 Uma leaves (Thaumatococcus Daniellii) for wrapping the Agidi Jollof when done. You can also put them in plastic containers or even aluminium foil. If you are in Nigeria you should be able to buy the wet corn starch known as Ogi or Akamu. You can also make yours at home. If you are outside Nigeria then you will most likely be using corn flour/starch. Ensure that the corn flour you buy is very fine. In Europe I can buy the corn flour known as Maizena. I love it because it is very fine and has the sour taste of Ogi or Akamu. This makes it taste as good as the Agidi Jollof that is made in Nigeria. Tomato Stew is tomato puree that has been fried in vegetable oil to remove all the water and tangy taste. Fresh habanero/scotch bonnet peppers bring out the best flavour in Nigerian meals but if you don't have those, it's alright to use dry ground cayenne pepper. Wash the uma leaves in plenty of cold water and set aside. Click here to see how to do that. Pound the pepper, that is if you are using fresh habanero/scotch bonnet peppers. Put the soft bones in a pot, add the chunks of onion and stock cube. Pour water to the same level as the bones and start cooking. When done, remove the chunks of onion and add salt to taste. Add the tomato stew, pepper and curry powder. Stir and cover to simmer then set it aside for later. Mix the corn starch/flour or Akamu/Ogi/Pap with the 200 mls of cold water in a pot. Please add water bit by bit because that's the best way to get a good mixture without lumps. This should be done off the stove. When done, boil some water. Pour the hot water into the corn starch mix, stiring at the same time till you notice it start to thicken. Transfer the pot to a stove and set the heating to low. Continue mixing/stirring till the agidi is completely solid. Add the Agidi Stew. Add enough quantity to give the Agidi Jollof a rich red colour. Do not add the bones at this time. Mix very well till the stew is well incorporated in the Agidi, giving it an even red colour. Add drops of water to the mix, cover and leave to simmer. Mix again to combine the water and the Agidi Jollof. Dish the Agidi onto the uma leaves and wrap it up. Place on your kitchen counter to cool down to a comfortable temperature. Serve warm with a chilled soft drink. When serving it as lunch or dinner, include Nigerian Fried Plantain or Fried Yam.